Coursework, exams, making friends and living abroad are problems that can face all students. According to The Student Room, in 2017 a quarter of students studying in the UK did not feel confident about being away from home. Located in the heart of London and with around 20,000 students, City has a wide range of activities and groups which can help students get to know their campus. One of them being CityBuddies, a scheme which pairs new students with current students on the same course. Out of the 1,010 pairings which builds the CityBuddies community, first year student Viviene Marie Dela Cruz, from The Philippines and fourth year student, Farah Said, from Malaysia, (BEng/MEng, Electrical and Electronic Engineering), give their advice to new students about how the scheme can help if you feel lonely at City. Why did you join CityBuddies? Farah: “I joined as I felt like I had a lot to offer as I too have come from another country to study at City. I know what it is like to arrive somewhere not knowing anyone and feeling lost all the time. What do you talk to each other about as CityBuddies? Viviene: “We talk about all kinds of things from the academic stuff to home sickness. What is the best piece of advice you have given your CityBuddy? How has being part of CityBuddies affected your university experience? Viviene: “CityBuddies has really helped me as it has introduced me to students who have faced and overcome the same problems I am faced with. Farah: “It has helped me make friends outside of my course year. However I also feel much more aware of things happening around the university, as Viviene’s questions have made me feel more responsible. Why should someone become a CityBuddy? Viviene: “It is so much easier to do something when you have someone there who has done it before. Farah: “I would encourage everyone to join CityBuddies, as even though you probably feel like you have not got much to share, your experience is very valuable. What would you say to anyone who wants to make new friends or is feeling alone at university? Viviene: “CityBuddies provides an opportunity to make a friend before you arrive at university, which is often the most difficult part. 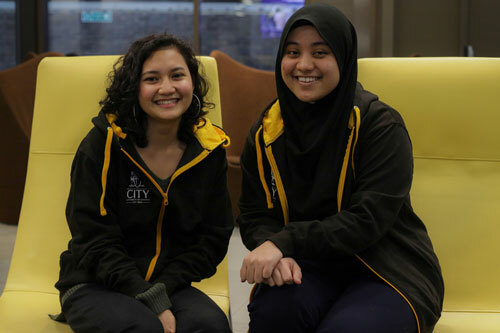 Farah: “Joining CityBuddies is one of the best ways to meet people at university. As a mentee, your mentor will have friends that you can also meet – it is a great opportunity to meet people outside of your year. “When you are new it is ok to be nervous, I told Viviene that she can break out of her shell and approach other students, she can talk to people in lectures and seminars and that is how you make friends. Students interested in becoming a CityBuddy can register their interest here. Applications for being a mentor will open in February 2019 and applications to be a mentee will open in July 2019. There will be a CityBuddies photography exhibition launch on Monday 4th February in the OTLT foyer. The panel exhibition will be displayed on the main walkway from 5th – 15th February and will showcase the impact that mentors have on their mentees’ university experience. All staff are invited to attend the launch and can do so by registering their interest here.